Duck Duck Go has become more popular recently, but still can't compete with Google for search volume and the relevance of results that come from personalization. Many Internet users are protective of their personal data, but in most cases, not willing to sacrifice personalized search results in favor of greater privacy protections. Those who care to hide their browsing activity have been using search engines like Duck Duck Go. 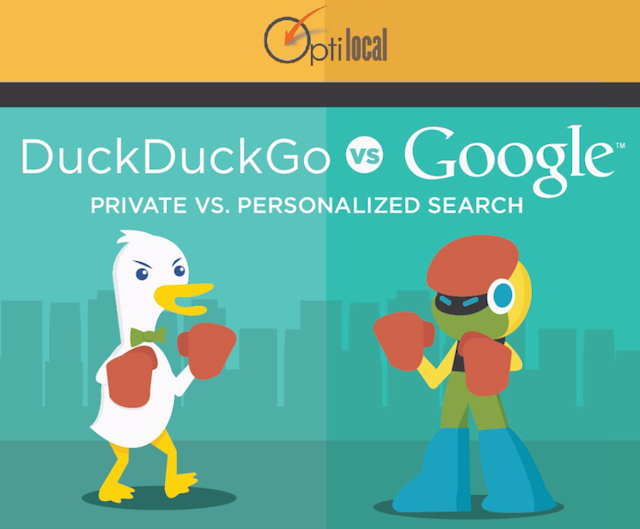 An infographic from SEO firm Optilocal examines the difference between highly tailored Google search, and highly private Duck Duck Go search. Google is undoubtedly the more popular search engine. In 2010, Google passed one-billion monthly unique visitors, and served more than one-trillion searches. in 2014, Google served more than two-trillion searches, while Duck Duck go managed two-billion for the first time. However the site’s popularity seems to increase every time there are new revelations about government tracking. The main difference between Duck Duck Go and Google’s search is that the former staunchly refuses to track its users. Duck Duck Go also has a policy that users will not be placed into filter bubbles, and the engine automatically diverts users to the encrypted versions of websites to protect them, even when they’re not searching. Duck Duck Go localizes search results, but only by request. It also presents ads, but there are only two presented with your search query, while Google serves many more ads. Google’s results also rely on a lot more personal information to populate its results, from IP address to personal information taken from Google+. Unfortunately for Duck Duck Go, the very thing that makes it unique is also what creates limitations. According to the infographic, search results from Duck Duck Go aren’t great. Without the benefit of personalization and automatic localization searching can involve extra steps when compared to the efficiency and relevance of Google. To see the other benefits and drawbacks of using each service, view the infographic at OptiLocal.